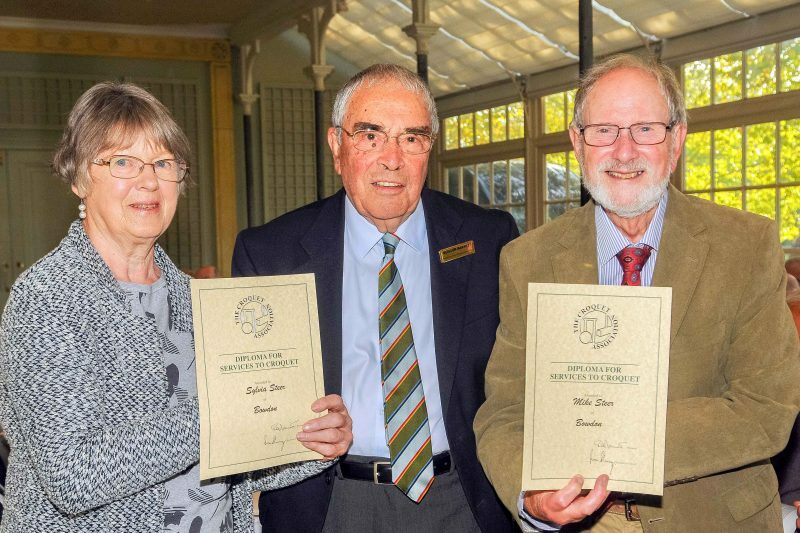 At the CA AGM and Council Meeting on 2oth October, five north west croquet players were awarded CA Diplomas for Services to Croquet – Mike and Sylvia Steer from Bowdon, Frank and Janice Moir from Bowdon, David Guyton from Chester. CA President, Quiller Barrett, presents CA Diplomas to Sylvia and Mike Steer (Bowdon) at the CA AGM on 20 Oct 2018. (Photo: Chris Roberts). Mike and Sylvia Steer joined Bowdon Croquet Club in 1996 and 1997 respectively and have both made a valuable contribution to the club. They have both been captains of several club teams and on winning teams in both Longman Cup and Sylvia in the Secretary’s Shield team. They have used their knowledge and skill to help with coaching on Taster Days and Beginners’ Courses for many years. Over the years Mike and Sylvia have welcomed many visiting players to stay at their home. They have also supported tournaments both in the UK and abroad over many years, most recently on the Isle of Wight. Frank and Janice have been members of Bowdon Croquet Club since 1999. Both have successfully played in class and knockout events. In addition, they have represented Bowdon in club teams competing in the North West Leagues. Frank has also been a past member of Bowdon teams that have been successful in CA competitions. – Supporting Coaching on Taster Days and Coaching Courses. – Tournament catering and social events. – Providing accommodation for visiting players, some International, coming to Bowdon. – Maintaining the Clubhouse – from emptying the dishwasher to cleaning out the huts & ensuring the bar doesn’t run out of beer. They have provided the floral displays outside the clubhouse – both summer and winter. Frank and Janice always make themselves available to offer friendship and support to new members whilst also concerning themselves with the welfare of sick and older members. 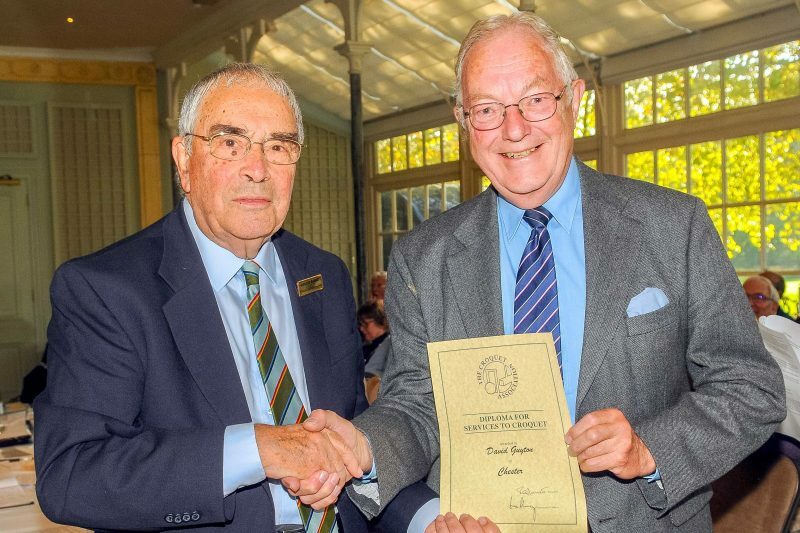 They have made an invaluable contribution to the promotion of croquet and the success of the Bowdon Club. Bringing a comprehensive management system to the club during a period of major expansion. Not only were roles managed to meet the needs of the club but he established a culture of willingness amongst members to do” their bit for the club” As well as Chairing the Committee for 11 years with all the normal duties that requires he initiated an annual planning evening where all members can raise issues and put forward ideas for the future of the club in a highly democratic manner. He continues to publish and manage a comprehensive annual calendar of matches and events. New club house and 25-year lease. In 2008/09 we had a new clubhouse which made a huge difference to all the members and potential members. David was instrumental in persuading the outgoing City Council to provide this clubhouse. He then painstakingly negotiated the long-term lease to secure tenure for the club. 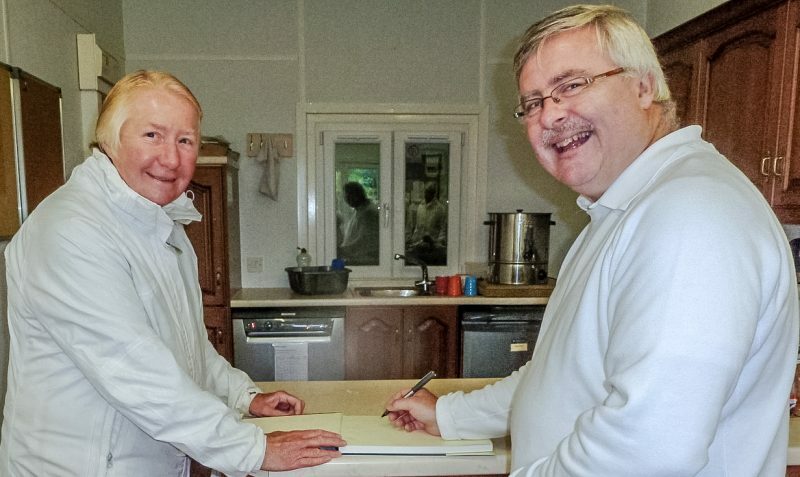 Liaising with the Local Authority, a role he still performs for the club. David tracks down the correct officials and councillors, organises meetings, explains the issues, and persuades them into action. A prime example this year has been lawn watering. The lawns have been in grave danger from the drought without a sprinkler system. David organised members to provide a working party to help the grounds-people and finally achieved daily watering of our lawns. Club Website. David taught himself the skills required to build a new website for the Club. He has completely authored the club website and is still a major contributor to regular updates. This required many dozens, if not hundreds, of hours dedicated to the single task. Contribution to the North West Federation and the CA. David has ensured that the club has played a full regional role. Under his encouragement the club hosts NW and National tournaments each year. David produced a new data protection policy for the club which was then taken up by others in the North West. He co- authored the note on roles within the CA to stimulate a more thorough approach to effective governance. 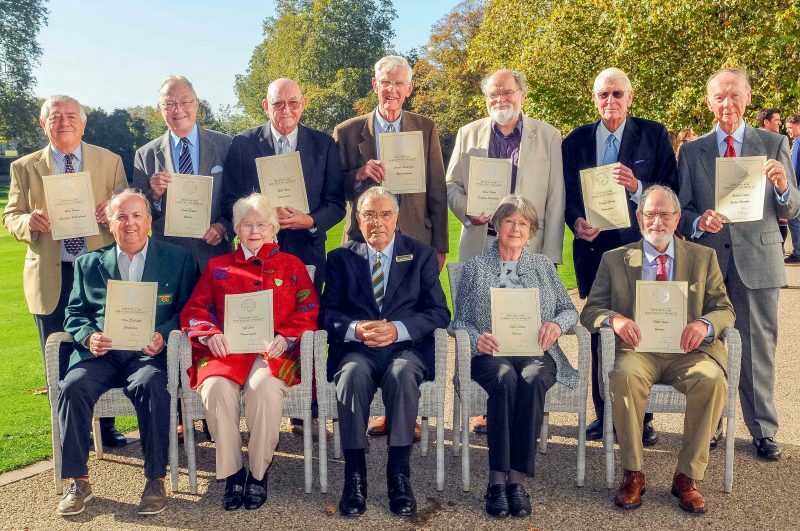 Some of the Recipients of CA Awards for Services to Croquet with CA President Quiller Barrett (seated centre) at the CA AGM (photo: Chris Roberts). Standing l to r: Mike Huxley; David Guyton; Mike Russ; Charles Waterfield; Steve Fisher; Douglas Gurney; Richard Field. Sitting l to r: Klim Seabright; Gill Catt; Quiller Barrett; Sylvia Steer; Mike Steer. The CA website does not list this new tournament, however Penrith and North Lakes beat Bowdon 7-4 in the last round of the area matches, then…..
2018 Inaugural All England Short Croquet Champions – Penrith & North Lakes – Robin Swindell, Geoff Sonley, Ian Ward, John Henderson. Advanced Level, no handicap restrictions. Advanced Level, players must have Handicaps of 0 or greater and teams must have a gross handicap of at least 4. – 29 Apr – Fylde lost 2-5 at home to Nottingham in a thrilling 1st Round match – see report on Fylde website here. 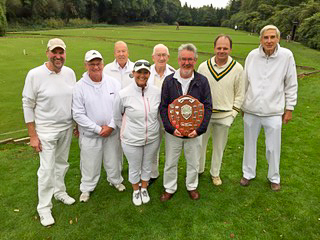 – 26 Apr – Pendle beat Tyneside 4-3 in close 1st Round encounter – see report on CA website here. 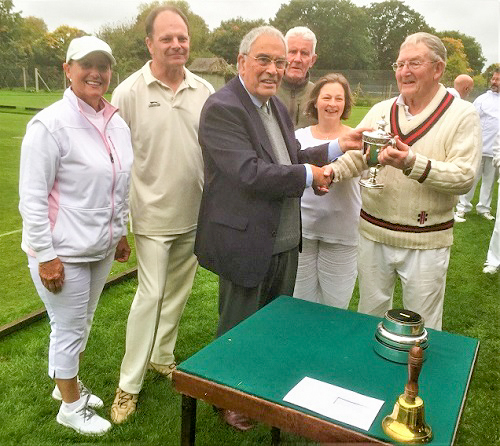 – 19 Sep – Chester defeated by Watford in semi-final – see report on CA website here. Handicap play, players must have a Handicap between 3.5 and 20. Teams must have a gross handicap of at least 24. Handicap play for players with a maximum handicap of 20. In each round, normally one doubles and six single matches are played in a single day by a team of four, but variation is possible – refer to the full regulations for details. 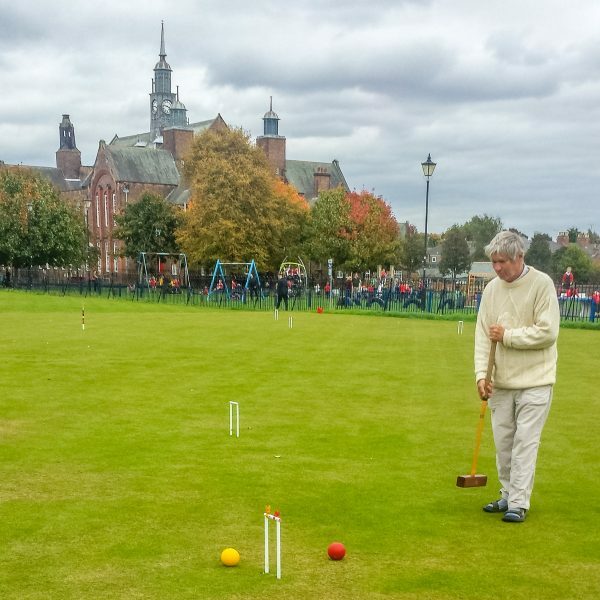 Robin Swindell (Penrith) playing at York in inaugural Short Croquet Competition. Alan Looney, Carrickmines President, presents the ‘Beyond the Pale’ trophy to Chester Captain, John Dawson. 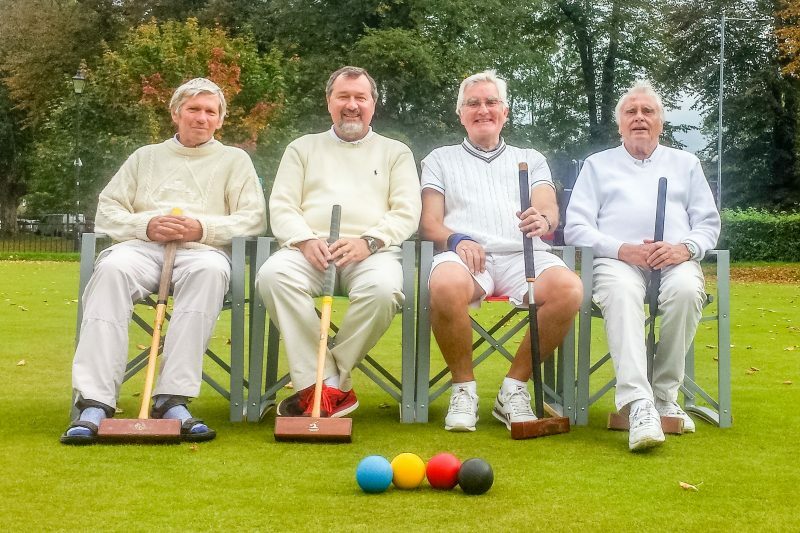 Whilst Dublin hosted its own special papal visitor over the Bank Holiday weekend, its premier croquet club (Carrickmines) travelled across the Irish Sea to Chester in an attempt to wrest the “Beyond the Pale” Cup from Chester Croquet Club. This time they brought an experienced team of AC and GC players. Even getting to Chester was tough – the ferry company cancelled its high speed hovercraft and the team was shunted onto a good “old fashioned” but slow ship. Then the Carrickmines skipper strained his back (one of his team mates jokingly suggested that it happened whilst picking up his wallet!). Friday evening was spent on a pre-match carbo-loading, hydration and bonding session in a thatched pub in Raby, on the Wirral. After fleeting rain Saturday was lovely; the Chester “sloping lawns” – somewhat sharpened by the summer drought made playing conditions tricky. The three AC matches went Chester’s way but the GC “round robin” was more closely contested. It was clear that Roger Edwards of Chester had scooped the individual prize but the team event went to a recount. Some Carrickmines players having misheard the location of the evening’s rehydration programme thought an “interesting night” lay ahead. Unfortunately the restaurant was merely “Moules a Go-Go”, disappointment was quickly put aside and kilos of seafood were consumed with the appropriate alcoholic beverage to wash them down. Sunday was “good news- bad news”. Good news- the lawns were more benign, the bad news – it was chucking it down. “Never seen rain like it ” a seasoned Carrickmines player said. Two hasty rounds of GC and one soggy AC match were closely contested. Yet another ferry cancellation brought proceedings to a premature end. Alan Looney, the Carrickmines President and captain, presented the cup to the Chester captain and declared “It’s been a great weekend. No matter how the Brexit discussions conclude the Chester team will be welcome at Carrickmines in 2019” and he presented the Chester Chair, Sarah Andrew, with a signed copy of the Carrickmines Club Centenary book. That done the Carrickmines convoy aquaplaned out of Westminster Park in hot pursuit of the Holyhead ferry. Alan Looney, Carrickmines President, presents a signed copy of the Carrickmines Centenary Book to Chester Chair, Sarah Andrew.